Packers RB Eddie Lacy is among five finalists for NFL Rookie of the Year for 2013, and fans can cast their votes from now until Tuesday, Jan. 28, to determine the winner. Joining Lacy as a finalist are Chargers WR Keenan Allen, Bills LB Kiko Alonso, Bengals RB Giovani Bernard and Vikings WR Cordarelle Patterson. Votes can be cast by clicking here. The winner will be announced at the third annual “NFL Honors” awards show in New York City, a two-hour prime-time special on Feb. 1 on FOX the night before Super Bowl XLVIII. Allen started 14 games for San Diego and helped the Chargers to a 9-7 record and a Wild Card berth in the AFC playoffs. He set the team record for the most receiving yards by a rookie in a season (1,046), surpassing John Jefferson’s mark (1,001) set in 1978. As the Chargers’ leading receiver, he became the first rookie in the NFL since A.J. Green in 2011 to eclipse 1,000 yards. Allen had 71 receptions and tied Eddie Royal for the team lead with eight touchdown catches. Allen had five receptions for 89 yards in the Chargers’ 27-24 Week 17 victory over Kansas City as San Diego earned a playoff spot for the first time since 2009. The California product was nominated for Rookie of the Week four times, winning the award all four times. Alonso, a second-round draft pick (46th overall) out of Oregon, played every defensive snap for the team this season. He ranked third in the NFL with 159 tackles, finished first in fan voting at the linebacker position for the Pro Bowl. Alonso’s career-high 22 tackles against Cincinnati in Week 6 were the second-most tackles by a player in a single game this season. He was nominated for Rookie of the Week two times, winning the award once. Bernard, drafted in the second round (37th overall) out of North Carolina, finished the season with 170 carries for 695 yards and five touchdowns. He was instrumental in helping lead Cincinnati (11-5) to an AFC North division title and a perfect 8-0 record at home. Bernard had 148 scrimmage yards (99 rushing and 49 receiving) in the Bengals’ 42-28 victory against Indianapolis in Week 14. He also recorded 100 scrimmage yards and a touchdown in the Bengals’ 27-24 overtime victory against the Buffalo in Week 6. Bernard was nominated for Rookie of the Week two times, winning the award once. Lacy, a University of Alabama product who was selected as the 61st overall pick in the 2013 NFL Draft, helped lead the Green Bay Packers (8-7-1) to their third straight division title and fifth consecutive postseason appearance. Lacy finished the season with 284 carries for 1,178 yards and 11 touchdowns setting franchise rookie records in all three categories. He rushed for a career-high 150 yards on 22 carries in a Week 9 matchup against division rival Chicago. 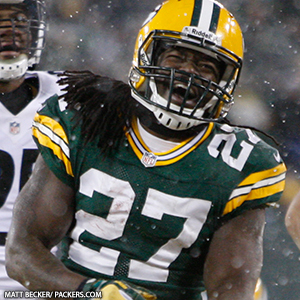 Lacy rushed for 84 yards and two touchdowns against Pittsburgh in Week 16. He also helped the Packers clinch the division title in Week 17 by rushing for 66 yards and a touchdown in a winner-take-all game against Chicago. Lacy, who led all NFL rookies in rushing yards and touchdowns, was nominated for Rookie of the Week seven times, winning the award once. Patterson, selected in the first round (29th overall) of the 2013 NFL Draft, set a Vikings record for most kickoff return yards in a season with 1,393 and was selected to participate in the 2014 NFL Pro Bowl as a return specialist. He finished his rookie campaign with 45 receptions for 469 yards and four touchdowns, adding 158 rushing yards and three touchdowns. He tallied five receptions for 141 yards and a touchdown, and added 111 kick-return yards for the Vikings against Baltimore in Week 14. Patterson had 228 kickoff return yards, including a 109-yard kick-return touchdown, against Green Bay in Week 8. He returned three kickoffs for 149 yards, including a 105-yard return touchdown, against Chicago in Week 2. Patterson is the only player in NFL history with four receiving touchdowns, three rushing touchdowns and two kickoff-return touchdowns in the same season. He also became the first player in NFL history with a 100-yard kickoff-return touchdown (109 and 105), 75-yard receiving touchdown (79) and 50-yard rushing touchdown (50) in a season. The former Tennessee Volunteer was nominated for Rookie of the Week four times.